Blueberry Almond Coffee Cake – a delicious coffee cake, bursting with bright blueberries and topped with crunchy, salty and sweet almonds. A wonderful addition to a breakfast or brunch, for Easter, Mother’s Day or anytime. My almost 3 year old twin girls love blueberries. Blueberries are at their best, of course, when they are available locally when they are in season. Here in New England, blueberry season is only for a short time period in the summer, typically early July – late August. We take full advantage of blueberry season, frequently picking our own and regularly purchasing at local farmer’s markets. Luckily we can still purchase blueberries year round at the supermarket, usually they come from Chile. Sometimes we get a wonderful batch from the supermarket, the berries are juicy and sweet and my girls gobble them up. Sometimes, however, the berries are on the tart side, and my girls won’t eat them. When this happens, I have a perfect excuse to bake something with blueberries. 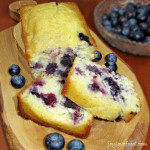 Last time, I had tart blueberries to use up, I made these delicious Lemon Blueberry Mini Loaves. This time around, my husband had been asking for awhile for me to bake something with nuts, so I decided to make one of our favorites, this wonderful Blueberry Almond Coffee Cake, the original recipe is from epicurious.com. This Blueberry Almond Coffee Cake is so delicious and easy to put together, my two girls had a great time helping me make it. I love fruit and nuts in coffee cakes. 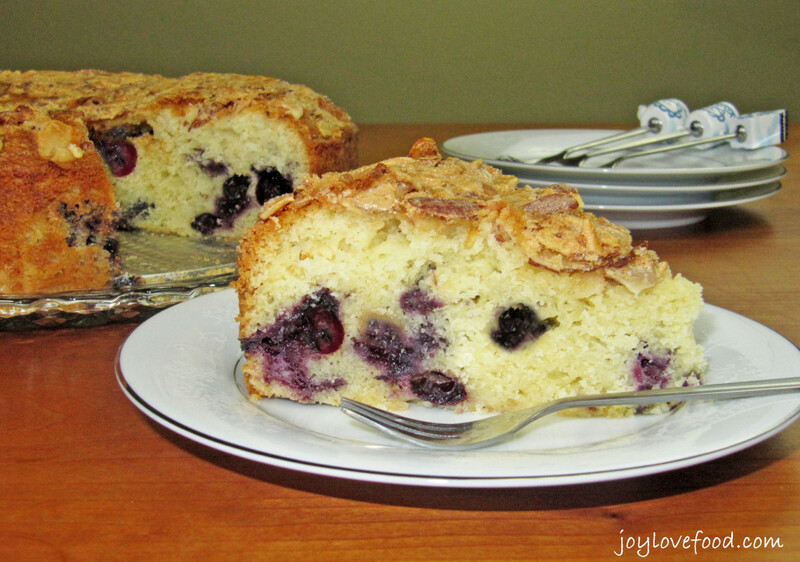 Blueberries and almonds are one of my favorite combinations and they go together beautifully in this coffee cake. This Blueberry Almond Coffee Cake is filled with fresh blueberries and includes a hint of almond flavor, which comes from the addition of almond extract. Sliced almonds are mixed with egg whites and some sugar and spread on top, which after baking in the oven, gives the cake a crunchy, salty and sweet topping. 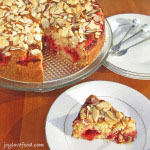 Cherries and almonds are another favorite combination, they go so well in this Cherry Almond Coffee Cake, that I made last December. A slice of this Blueberry Almond Coffee Cake is wonderful with a cup of coffee for breakfast, or along with a cup of tea for an afternoon snack. 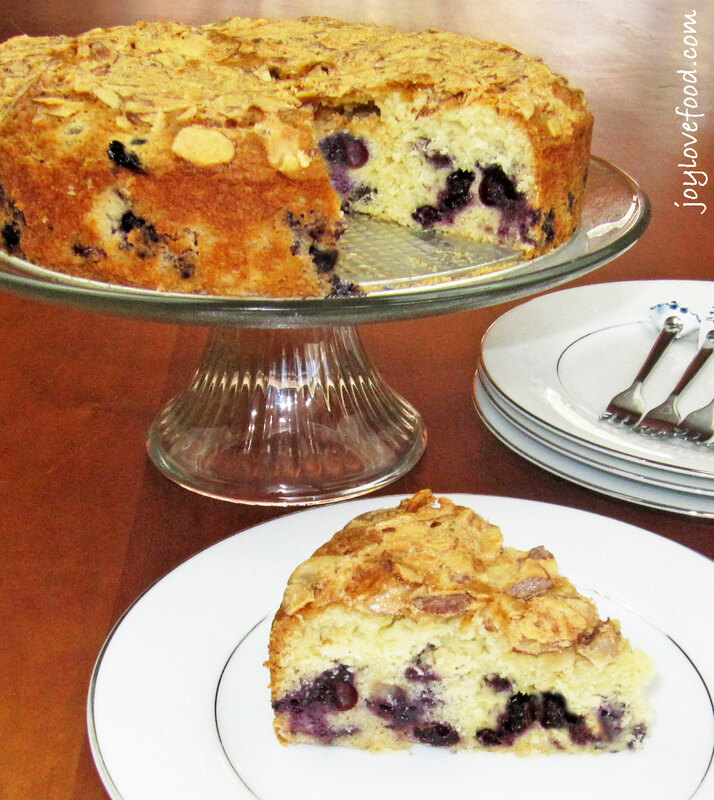 This beautiful Blueberry Almond Coffee Cake would also be a pretty addition to a special breakfast or brunch for Easter, Mother’s Day or anytime. Bursting with bright blueberries and topped with crunchy, salty and sweet almonds, this pretty, delicious Blueberry Almond Coffee Cake would be a wonderful addition to a breakfast or brunch, for Easter, Mother's Day or anytime! Preheat oven to 350°F. Lightly grease a 9-inch springform pan. In a large bowl, using an electric mixer, beat 1 ¼ cups sugar and butter until light and fluffy. Add eggs, one at a time, then almond extract and beat well after each addition. Add flour mixture to egg mixture, alternating with milk, beginning and ending with flour mixture, beating on low speed after each addition to combine. Pour batter into prepared springform pan, spreading evenly. In a small bowl, lightly beat egg white with a fork. Stir in almonds and 3 tablespoons sugar. Spoon almond mixture over batter in pan, spreading evenly. Place pan in preheated oven and bake for 1 hour – 1 hour 15 minutes or until a tester inserted into middle of cake comes out clean. Cool pan on a rack for 10 minutes. Using a knife, cut around edges of pan, release sides of pan and remove. You can substitute a 2 – 2 ½ quart (2 ¼ inch deep) baking dish for the springform pan, be sure to adjust the baking time accordingly. This entry was posted in Breakfast & Brunch, Cakes & Cupcakes, Desserts & Sweet Treats and tagged almonds, blueberry, coffee cake, recipe. I love that you added almonds to this recipe. It sounds like a delicious combination with the blueberries. I’m lucky too that I can get them year round! Thanks Sandra! The almonds do indeed go so well with the blueberries! This looms absolutely delicious Joy! Wish I could try some now! 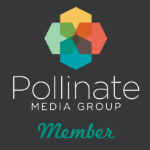 Pinned and thanks for sharing it at the Say G’day Party this week and look forward to seeing you next week! Wow, this looks so yummy. 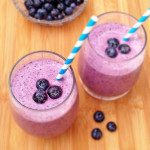 I love blueberries so this is right up my alley. 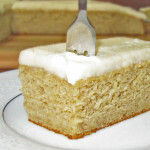 I absolutely must try this wonderful coffee cake! The berries and almonds make it look irresistible! Thanks Julia! I hope you give this a try and enjoy! 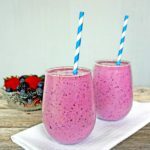 Thanks for sharing this recipe at Inspire Me Monday Joy – I’ve been eyeing it ever since it hit my inbox! 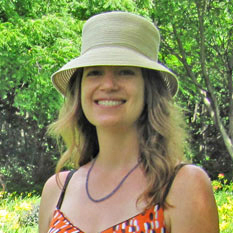 Thanks so much for the feature Ramona! Yummy! Pinned. Thank you for sharing at Merry Monday! Wow that looks so good. Wish I had a slice right now! Looks so Yummy Joy!! I love blueberries!! Thanks for sharing on My 2 Favorite Things on Thursday!! Hope to see you tomorrow!! Pinned!! Thanks Elaine, I will be there! Your coffee cake looks wonderful, especially with the almond layer on top! Sounds absolutely delicious! Thanks Maria, the almond layer is indeed wonderful! Yet another wonderful recipe! Thanks so much for sharing at the This Is How We Roll link party! See you on Thursday! We love blueberries in our house and the season is getting closer! YAY. I still have several pounds in my freezer that I froze from last summer so I’ll be adding this recipe to my recipe box to use them up before they are replaced with new ones. Thanks Brandy, how nice to still have fresh blueberries in your freezer, hope you give this a try and enjoy! We would just love your Blueberry Almond Coffee Cake. Thanks Miz Helen, see you next week! Yum! I can eat almonds on almost anything. Have you ever tried a cake recipe with almond flour in it? 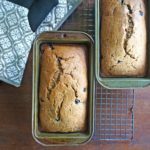 It makes the cake super moist and I’m sure it will add more almond flavor! Thanks Cathy! I haven’t used almond flour in cakes before, I’ll have to give it a try! HI Joy, as always you are making my mouth water with your recipe! I can see why your girls love it, it looks divine. Looks yummy! We really like blueberries in our house so I think we would enjoy this a lot. Joy, the cake looks absolutely delicious! I wish I could reach your beautiful blueberry cake and have a generous slice of it! Thanks so much Hadia, I will save a nice slice for you! Yum, this looks divine! I love blueberries in muffins, and this reminds me of that. Have a great weekend! Looks so yummy! I could definitely go for a slice of this right now! We have a blueberry bush, but the birds always beat me to them…I’m going to try to more watchful this year! Thanks Michelle, how nice to have a blueberry bush, I hope the birds will save some for you! Oh my word this looks AMAZING Joy! Going on my list of must try recipes! Have an amazing weekend and thanks for joining us at Friendship Friday! Thanks so much, hope you give it a try and enjoy! Thanks Susan, hope you give this a try and enjoy! This looks so tempting and blueberries and almond combo is a new one. I love berries of any kind. I freeze them and toss them in all types of breads and desserts just like this one! Love the addition of the almond flavor here, too. A natural pairing for the tart blueberries! I love fresh blueberries and the combination of almond with the berries is perfection. Thanks Kristen, I agree, blueberries and almonds are a wonderful combination! Love blueberries too but not the tart ones either. What a fabulous way to enjoy them. Thanks Christie! This is indeed a good use for those tart blueberries! That crunchy topping puts this blueberry treat over the top! Yum Yum. Thanks Christine! The crunchy topping is indeed delicious! I’m with the girls, I love blueberries! 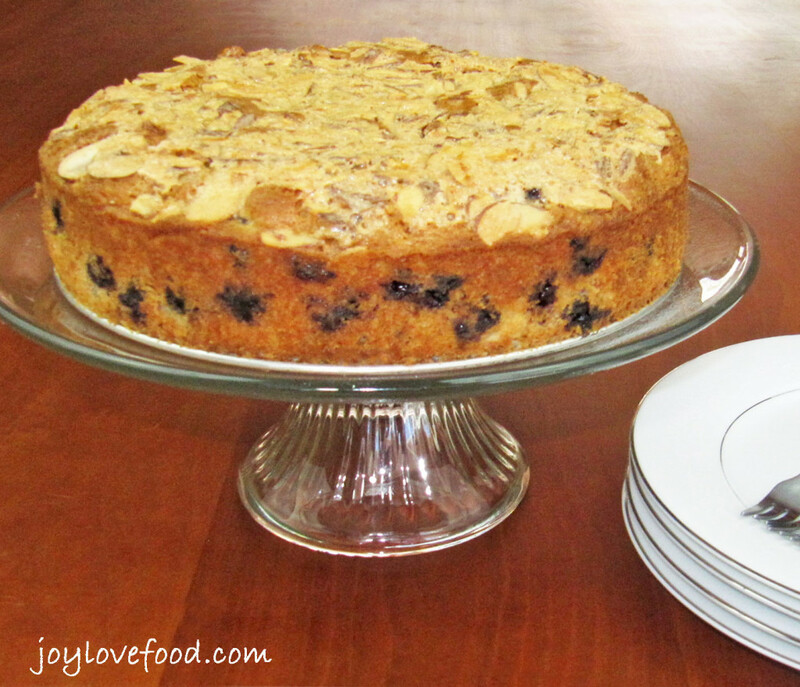 I usually make jam, but I will have to give your coffee cake recipe a try, it looks delicious! I can’t wait for blueberry season! Thanks so much for coming by! What a charming cake! I’ve honestly never thought of putting almonds on top like that. I tried it and the crunch on top it provides sends you over the moon! Thanks for such a great recipe! Hi, Joy! I love blueberries. I don’t think I’ve ever had a blueberry almond combo, but it sounds delicious! Yum! It looks so pretty too. I just love breakfast foods… and especially breakfast cakes!